Krsna Deity of a bygone era. The holy town of Udupi lies on the Arabian Sea in the South Indian state of Karnataka. 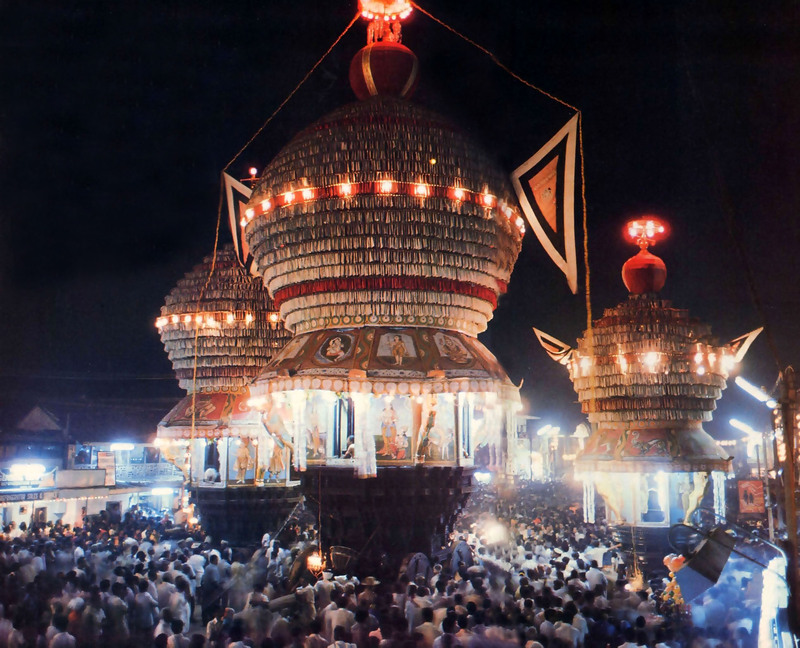 The town is famous as a place of pilgrimage because of the temple Sri Krsna Matha. This temple was founded by Srila Madhvacarya (A.D. 1238-1317), one of the greatest saints, philosophers, and religious reformers of India. Udupi is said to have attained the status of Vaikuntha, the kingdom of God, because the Supreme Personality of Godhead came and stayed there in response to the desire of His pure devotee Srila Madhvacarya. 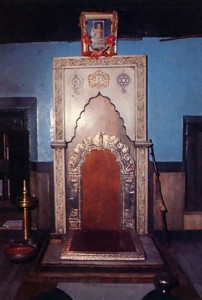 Srila Madhvacarya, in the years before he founded the Sri Krsna Matha, was affiliated with the Sri Anantesvara temple. Here he used to hold audiences spellbound with his learned discourses on the science of Krsna consciousness. Within the temple compound he would regularly hold debates with scholars opposed to pure devotion to Lord Krsna as the ultimate end of Vedic knowledge. Madhva never lost a debate. After founding Sri Krsna Matha, Madhva made it the center for all his activities. Tradition still has it, however, that pilgrims go first to Candramaulesvara and offer their respects to Lord Siva, then to Anantesvara to offer respects to Lord Visnu, and finally go across the street to Sri Krsna Matha to worship Srila Madhvacarya’s original Deity of Lord Bala Krsna, the Supreme Personality of Godhead as a young child. At the gala reception for the procession. His Holiness Visvesa Tirtha, the present paryaya svami of Sri Krsna Matha, offers rice cakes to the bullocks. 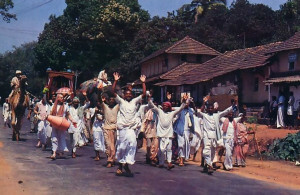 At journey’s end in Mayapur, West Bengal, in March 1986, the pilgrims will have traveled four thousand miles. The amazing story of how the Bala Krsna Deity crossed the ocean from faraway Dvaraka in Northwest India to Udupi in the south is told in Madhva-vijaya, the biography of Srila Madhvacarya. Madhva wanted to have a temple of Lord Krsna in Udupi; the devotees could then worship and serve the Lord and ennoble their souls. Well, it so happened that in Dvaraka, one of the main places of Krsna’s pastimes on earth five thousand years ago, a Deity lay concealed within a large mass of gopi-candana clay (the yellowish clay Vaisnavas use daily in marking their freshly bathed bodies as temples of Lord Visnu). No one knew the Deity was there, but because the lump of clay was exceedingly heavy, some sailors loaded it onto their merchant ship as ballast. On the ship’s southward journey, just off the coast of Udupi, a tempest blew the ship aground on a sandbank. On festival days honoring the various incarnations of Krsna, the Deity is dressed to look like a particular incarnation. The Lord appears as Matsya, the fish incarnation who saved the Vedas from a great flood even as He sported in the vast waters. Photographing the Deity is rarely allowed. On that very day, Srila Madhvacarya absorbed in composing Dvadasa-stotra, his famous twelve-part poem praising Lord Krsna, had gone to the beach to bathe or, as some say, to receive the Lord. Upon seeing the ship caught fast on the sandbank and hearing the cries of the sailors in distress, Srila Madhvacarya waved his cloth in their direction. This calmed the stormy seas, and the ship floated free. Madhva then guided the vessel to safety. Eager to show his appreciation, the captain offered Madhva whatever he wanted from the ship’s cargo. 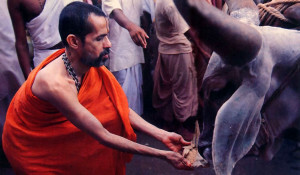 Madhva chose the heavy lump of gopi-candana clay. Using a gold palanquin, priests carry the ursava (festival) Deity from the temple shrine to Car Street. Disciple attendants of Madhvacarya had just started back to Udupi with the large lump of clay when, but a short distance from the beach, the lump broke in two, revealing the handsome Deity of Lord Bala Krsna. But now the combined effort of thirty of Madhva’s disciples could not budge the Deity. Only when Madhvacarya himself embraced and lifted the Deity as if He were a child did the Deity consent to be moved. 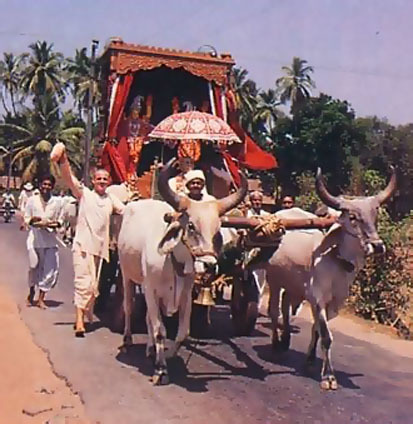 In great transcendental ecstasy Madhva carried the Lord the four miles back to Udupi. On the way he completed the remaining seven parts of Dvadasa-stotra, reciting the verses out loud. 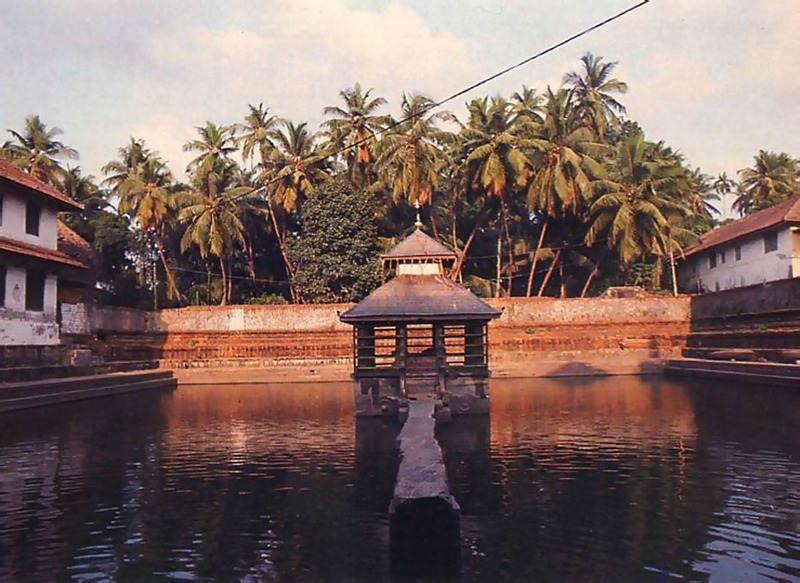 Back in Udupi, Madhva bathed the Lord in the lake known as Madhva-sarovara and enshrined Him in the Sri Krsna Matha. Srila Madhvacarya instituted rigorous standards for worshipping Sri Krsna, and whenever he was in Udupi he would personally perform the thirteen daily worship ceremonies for the Lord. 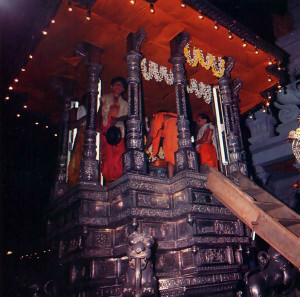 Then the Deity is carried to His throne on a silver chariot. The evening parades last about two hours, and residents and pilgrims alike turn out to sec the Lord riding high upon His cart. How the Deity of Bala Krsna had come to be buried in Dvaraka is told in Prameya-navamalika-tika, a work from the seventeenth century by Raghuvarya Tirtha, an acarya in succession from Srila Madhvacarya. Once, during the time of Lord Krsna’s manifest pastimes on earth, mother Devaki lamented to the Lord over her misfortune at never having witnessed the Lord’s childhood pastimes in Vrndavana. She entreated the Lord to make her happy and fortunate, like mother Yasoda, by showing some of His childhood feats and frolics. The Supreme Personality of Godhead, just to give pleasure to His pure devotee, at once assumed the form of a small child and clambered all over Devaki’s lap. Later, when Devaki went to churn butter, Krsna, acting like an ordinary mischievous child, broke the churn, ate the lumps of butter, and even smeared butter all over his transcendental body. He then snatched the churning rod and rope from Devaki’s hands. After sporting like this for some time, the Lord again assumed His usual form of eternal youth. Mother Devaki was thrilled beyond measure to see this childhood pastime of the Lord. 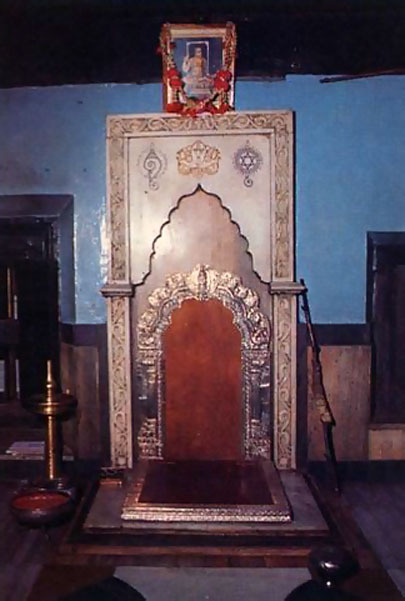 From this seat in Sri Krsna Matha, Madhva spoke on Krsna consciousness, guiding his disciples in spiritual life. Queen Rukmini-devi, Lord Krsna’s consort, witnessed these pastimes, and the Lord’s mischievous behavior and childhood features enthralled her. To preserve the memory, she had a Deity made of child Krsna holding a churning rod and rope. Queen Rukmini began to worship this Deity regularly. Later, after the Lord returned to the spiritual sky with His retinue, Arjuna deposited the Deity in a place called Rukminivana. 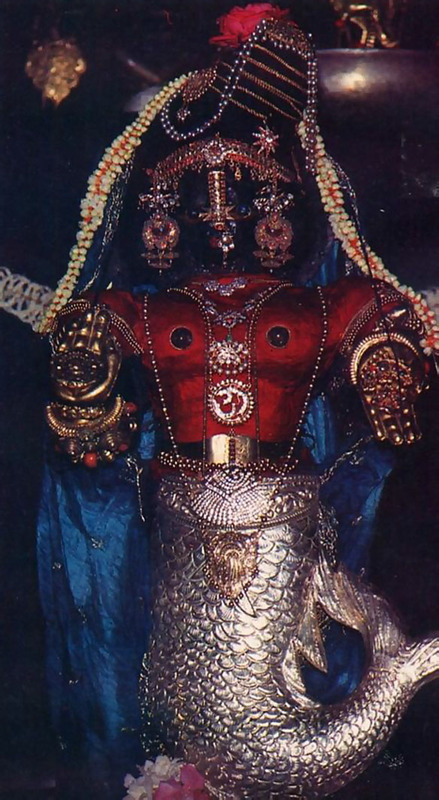 In the course of centuries the Deity became completely covered with clay, and it remained in that condition near Dvaraka until merchant sailors brought it to Madhvacarya at Udupi. Before his departure from this world, Srila Madhvacarya appointed eight of his sannyasi disciples to take charge of the worship at Sri Krsna Matha and to continue propagating Krsna consciousness in the region. Today the responsibility for the worship is rotated in two-year periods called paryaya among eight sannyasis in disciplic succession from the original eight. During the fourteen-year interim period between turns at paryaya, each sannyasi travels and preaches and raises funds for use when his turn for worship comes. During his paryaya, he personally performs the thirteen daily ritual services to the Deity. Within the temple compound the quaint Madhvasarovara serves as the traditional bathing place for the priest and his attendants. Each sannyasi also heads his own matha, where other Deities, ones given by Madhvacarya to the original eight sannyasis, are worshipped. These eight mathas are located along Car Street, a road that circles the Candramaulesvara and Anantesvara temples and runs right past the main entrance to Sri Krsna Matha. Car Street is where parades such as the one pictured at the opening of this article are held. 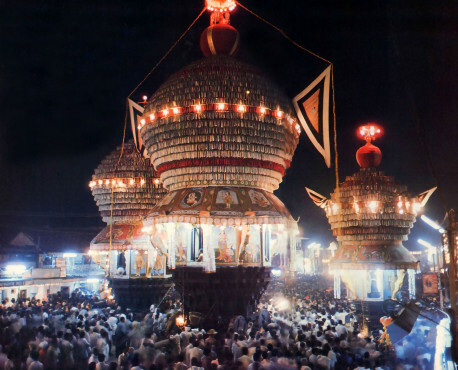 According to the significance of the festival being observed, sometimes only one cart and sometimes all three are used. A fourth cart, completely covered in silver, is used for special festivals. Replete with a decorated elephant and a musical band, a parade on Car Street is an almost nightly event in Udupi. Residents and pilgrims alike turn out en masse to see the Lord riding high upon His cart and smiling beneficently upon the adoring devotees. The procession stops at intervals along the route, and the Lord is entertained by fireworks displays or worshiped by offerings from His many devotees. The parades start at eight and are usually over by nine-thirty. For twelve years Madhyageha Bhatta would regularly travel the eight miles north from his village of Belle to Udupi. There at the Anantesvara temple he would pray for a son. One day a devotee in a trancelike state climbed the temple flagpole and announced that to reestablish the purest principles of religion, a male child, an incarnation of Vayu, the demigod in charge in air, would soon be born. Madhyageha understood within his heart that this would be his own child. Soon his wife, Vedavati, gave birth to a son. The happy couple named him Vasudeva. From infancy Vasudeva showed extraordinary intellect, so much so that he was given brahminical initiation at age five, three years early. Whatever he heard of read, even just once, he could remember. His body was unusually strong, lustrous, and beautiful. At age eleven, Vasudeva left home for Udupi, to live with Acyutapreksa, an ascetic widely respected for his scholarship and saintly character. After one year, despite strong protest from his father, Vasudeva renounced the world. Acyutapreksa named him Purnaprajna. 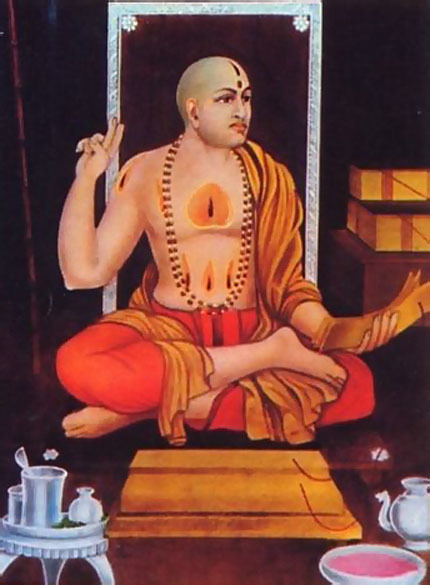 Less than forty days after taking sannyasa, Purnaprajna defeated Vasudeva Pandita, a famous wandering scholar, in a public debate. The pandita was known for his hair-splitting dialectical ability, but he was no match for young Purnaprajna. The pandita spoke for three days and then dared anyone to refute his conclusions. Purnaprajna shocked the crowd when he accepted the issues, he repeated almost verbatim the pandita’s arguments. Then, one by one, he smashed them all. His victory was the talk of Udupi. Acyutapreksa gave him the title Anandatirtha, in recognition of his mastery of Vedanta. Word spread far and wide about the debating skill of the young ascetic in Udupi. Challengers and admirers converged on the town. Buddhisagara and Vadisimha, two Buddhist monks who had converted many to their fold, challenged Anandatirtha. After a day-long skirmish, they promised to return the next day. That night, however, they secretly fled from Udupi. Anandatirtha went on a tour of South India. The most notable events on this tour were two encounters with Vidyasankara Svami, the lineal successor to Sripada Sankaracarya, who was the original propounder of the monistic theory of the Absolute Truth. Some basic tenets of Sankaracarya’s philosophy are as follows: God and the soul are identical; the formless, senseless, impersonal Absolute is the only reality; all else is illusion; and the incarnations of God are all products of illusion. Anandatirtha was thoroughly familiar with this doctrine, so he knew all its weak points. With firmness and courage he challenged the venerated Vidyasankara, and a fierce debate ensued. Vidyasankara could not defeat his opponent, yet he refused to accept defeat. They met again, in Ramesvaram, during the monsoon season, at which time Vidyasankara taunted and harassed Anandatirtha. But the young saint tolerated the abuse. On his return journey, while addressing an assembly of learned men, Anandatirtha stated that every Vedic utterance conveyed a triple meaning, that each verse of the Mahabharata had ten meanings, and that each of the thousand prominent names of Lord Visnu had a hundred meanings. When the astonished assembly demanded he prove his statement, Anandatirtha explained a hundred meanings of Visva, the first name of Visnu. Before he could proceed further, however, they begged him to stop, admitting they didn’t have the intelligence to comprehend his elaborate explanations. Back in Udupi, Anandatirtha, who was now known as Madhva, wrote a commentary on the Bhagavad-gita and gave a copy to Acyutapreksa for his approval. Madhva’s next tour was to Badarinatha, high in the Himalayas. In Badarinatha he met Srila Vyasadeva, the author of the four Vedas and their voluminous supplementary literature. In preparation for this meeting, Madhva had observed complete silence and complete fasting for forty-eight days. He learned the full meaning of the Vedanta-sutra, the distilled essence of Vedic wisdom, from the transcendental author himself and promised to write a commentary on the sutras, one that would be faithful to Srila Vyasadeva’s original intent and purport. By the time he came down from the Himalayas, his commentary, Sutra-bhasya, was completed. He sent a copy ahead to Udupi for Acyutapreksa’s approval. On his return trip, Srila Madhvacarya converted Sobhana Bhatta and Sami Sastri to Vaisnavism. They later became successors to Madhva, as Padmanabha Tirtha and Narahari Tirtha. Madhva refused to let Narahari take sannyasa, ordering him to remain in his high governmental position, in return for which he was to obtain the Deities of Mula Rama and Sita, lying in the King of Kalinga’s treasury. For many years Narahari remained in that service, until finally, just three months before Madhva’s departure from this world, Narahari brought the ancient images of Sita-Rama to his guru. These were the original Deities of Rama and Sita, worshiped by Maharaja Iksvaku and then by Maharaja Dasaratha, the father of Lord Rama. Then during the time of Lord Krsna’s advent, the Pandavas gave them to the Gajapati kings of Orissa. Eventually the Deities were kept in the king’s treasury. While still in his twenties, Srila Madhvacarya undertook a second tour to Badarinatha, this one after he had founded Sri Krsna Matha in Udupi. On the way, a tyrannical king pressed Madhva’s party into digging a reservoir for the city of Devagiri. Madhva, however, persuaded the king himself to take part in the digging and then left with the party. The pilgrims had many other hardships and misadventures, but Madhva always saved them with his quick thinking and mystic powers. In Badarinatha, Madhva again heard from Vyasa, who gave him eight sacred Salagrama stones. On his return trip Madhva stopped in Goa, where he enacted an amazing gastronomical feat. Previously he had eaten a thousand bananas in one sitting. But in Goa, he outdid his earlier record. He ate four thousand bananas and then drank thirty pots of milk. When asked to prove that plants indeed respond to music, Madhva took a few seeds in his palm and began singing in his melodious voice. The seeds sprouted. Madhva continued singing, and the plants grew, swaying to the melody. Madhva continued singing. The plants grew into full maturity and yielded the fruits and flowers. News of this feat spread everywhere. From Udupi Madhva traveled south again. In Visnumangalam he debated with Trivikramacarya, a logician and grammarian of remarkable skill, who was able to make the Sanskrit language convey any meaning that suited his purpose. The debate lasted fifteen days, and in the end Trivikrama surrendered at Madhva’s feet. A full account of that debate is given in the Madhva-vijaya, written by the son of Trivikramacarya. News of Trivikrama’s conversion brought hundreds more men and women into Madhva’s fold. His life’s mission thus became firmly rooted in India. Srila Madhvacarya wrote thirty-nine books clarifying the tenets of Vaisnavism and showing Vaisnavism to be the true Vedic religion. In many of his works he attacked the monistic creed of Sankaracarya’s followers, exposing to impede Madhva’s mission by less honorable means. They tried to defame him, declaring him a heretic and all his followers outcasts. They even stole his writings and his valuable collection of ancient books, thinking that without literature his mission would be finished. Somehow, King Jaya Simha of Visnumangalam acquired the books and returned them to Madhvacarya. Madhva had appeared in two other incarnations. During the time of Lord Krsna’s appearance on earth he appeared as the warrior Bhima, one of the five Pandava brothers. During the time of Lord Rama, he incarnated as the beloved Hanuman, the ideal servant of the Supreme Lord. And, as in those incarnations, Madhva performed many feats of strength and displayed mystical perfections. As a child he would appear suddenly in one mighty leap from anywhere in mighty leap from anywhere in response to his mother’s call. In school he cured a friend’s headache by blowing in his ear. To help his father out of debt he turned tamarind seeds into money. On two occasions he made seeds sprout into plants by his singing. An enormous rock in Ambu Tirtha, requiring at least fifty men to move it, bears an inscription stating that Madhvacarya placed it there with one hand. Many times Madhva made small quantities of food increase for distribution to hundreds of people. At the age of seventy-nine, his mission well established, Srila Madhvacarya passed away. 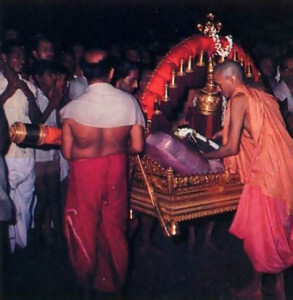 His devotees say he went to Badarinatha to join Srila Vyasadeva. Note: The International Society for Krishna Consciousness (ISKCON) is in the sampradaya, or disciplic line, from Madhvacarya by way of the Gaudiya Vaisnavas, the Bengali school of Krsna devotees. The members of ISKCON are connected to the Madhva-sampradaya through Laksmipati Tirtha, A Madhvaite who initiated Srila Madhavendra Puri, the grand-spiritual-master of Lord Caitanya Mahaprabhu. Srila Prabhupada, the founder and spiritual master of ISKCON, is eleventh in the disciplic line from Lord Caitanya. 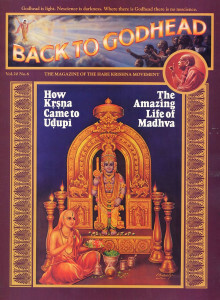 Because of this connection to Madhva, Udupi holds special interest for ISKCON members. It is the place where one of the predecessor acaryas boldly preached Krsna consciousness, the Absolute Truth, and delivered many conditioned souls from illusion and ignorance.